1.1 How to run leparagliding? 1.2 Why is it so difficult to use leparagliding? There could be more easy? 1.3 I can run LEparagliding on MAC OSX? 1.5 Sometimes the leparagliding.dxf file does not open with AUtocad. Why? 1.6 leparagliding pre air2dxf lepc and others executables not running in new Windows version. Why? S1.1 Drawing "scale" parameter in SECTION 1. S1.2 Wing scale parameter in SECTION 1. S1.3 In SECTION 1, What effect does the second parameter?, boolean 1 or 0? S1.4 "Rib geometric parameters" (x-rib, y-LE, y-TE, xp, z, beta, ...) You can put a simple example? S1.5 Rib geometric parameters, how to calculate the "beta" angle? Note that leparagliding.txt contains the design of an example paraglider. 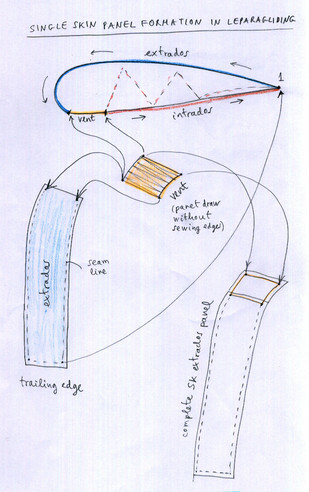 There is not a real design, is intended only to show the possibilities of diagonal ribs type 5. 3) The program is ready to run because leparagliding not need installation. Simply copy the folder and its content to your working directory. Double Click in e.exe, and after a few seconds, some output files (.dxf and .txt) should appear in the same working folder. 5) That's it! Nothing spectacular! The plans are in 2D format in file leparagliding.txt and in 3D in file lep-3d.dxf. Is need a powerful dxf file editor program. This can be a major difficulty if you are not accustomed to working with CAD files types dxf / dwg. DXF format is used to work very precisely and make small changes and improvements on plans obtained. It is also used to prepare PDF files for printing, or create DXF / DWG for use in a computerized laser cutting table. Files lep-out.txt and lines.txt contains a summary of the technical parameters of the wing and the list of lines with their lengths. And you can open with any text editor. The difficulty of the design is to correctly understand and write the data file leparagliding.txt and associated profiles files. Please, study the manual. Note: current executables only for 32-bit. Soon also compiled for 64-bit. However the ideal is that you compile yorusefl in yor machine using gnufortran compiler. 2. Why is it so difficult to use LEparagliding? There could be more easy ? Yes, it would be possible in the future to make a GUI (graphical user interface) to write file leparagliding.txt and profiles, graphically and interactively. A Swiss programmer is currently working on this issue. Be patient, beacuse is a very complex task that needs a lot of work. Now I prefer to concentrate on the content and the proper functioning of the geometry routines. Write leparagliding.txt file is much easier than programming a GUI. Also, I find more neat and orderly easily write data in file leparagliding.txt that through a bunch of menus. On the other hand, before writing the data, pre-processing work is essential, then run the program, then a post-processing work. The pre-processing and post-processing parts are very important for good design. 3. I can run LEparagliding in MAC OSX? Yes, of course. Some have done successfully. Source code file leparagliding.f is written in "gnu Fortran". Just install a Fortran compiler. Install gcc, f77, g95, fort77, f2c, gfortran, or similar to your computer. 5 Sometimes the leparagliding.dxf file does not open with Autocad. Why? Sometimes, numerical errors occur in the calculation, usually divisions by zero, or similar. Then the program writes the parameter "nan" or "NaN" ("Not a Number") instead of a numerical value. The program interprets the DXF file as incorrect and does not open it. A solution is to open the file with a text editor (recommended to use gvim) and to automatically replace the "nan" or "NAN" characters with "0". This converts the DXF file interpretable by Autocad. If there are errors in the drawing, they are usually easily identifiable and easy to fix. S1.1 Drawing scale parameter in SECTION 1. Wing scale (1.0) is the usual value. Is a design parameter. If you design a wing with this setting specified in 1.0, you get a wing size “M” of surface “A” in m2. If you want to make another wing of the same model but different size, just you need change this setting, leaving all others unchanged. For example, for size S, you can use the parameter 0.95 and the new surface is A x (0.95)^2. For a size L, you can use a parameter 1.05 and the new surface is A x (1.05)^2. In order to correctly calculate the lengths of the lines, in single skin gliders, the triangles are automatically aligned in the same direction of the forces of traction of the top lines. Indeed, according to the distribution of the ramifications of the top lines, there are some lines that tension in converging directions, and others in diverging directions. But the lines anchored in the “A” row (leading edge) do not cause rotations in profiles, because the small area of soffit (bottom surface) prevents it. It would be possible to rotate profiles in row “A”, but it is very rare design. This parameter leave the freedom to do it or not by the designer. 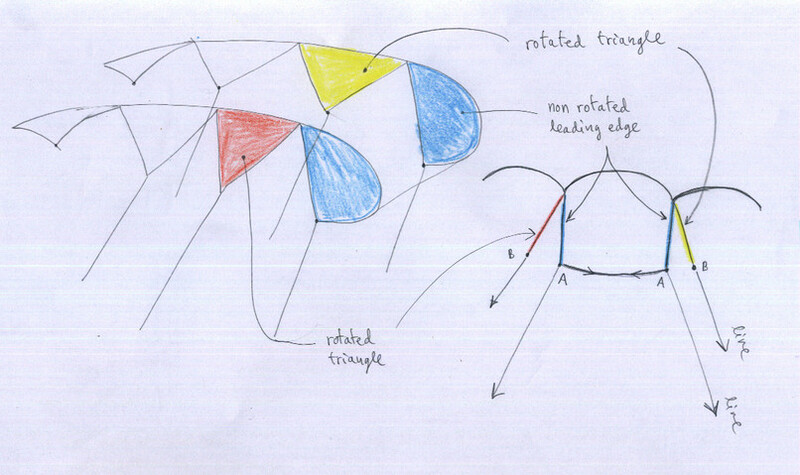 See figure “Rotated triangles.jpg”. A new feature in 2.35 version (not documented before), prevent rotation of all triangles in specified ribs. This is useful for special line designs like BHL-Pampa. 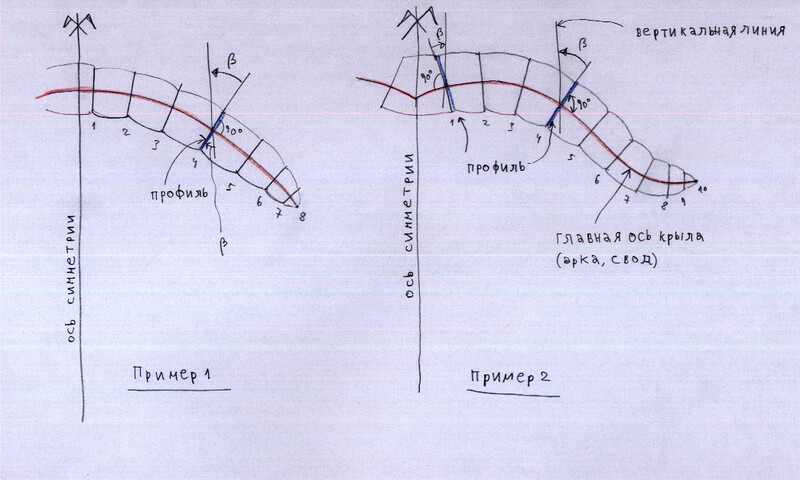 First, it is necessary to draw the shape of the wing (plan view in axes X-Y, front view in axes X'-Z). Take into account the orientation of the axes. It is obligatory to do so before starting to work with the program. It is better to draw using AutoCAD or similar programs. But it can also be in old style with graph paper and a pencil (also the result will be perfect, because you will be obtained numerical coordinates). Then it is necessary to measure the coordinates of the main points of the edge, the trailing edge and the frontal arc. We must also measure the angle beta. This may seem laborious, and it is. But it is very important. The pre-processor program, helps greatly to do that. - The angle beta, is by definition the angle between the profile lines and the vertical reference line. Geometrical conditions to be considered is that the profiles are taken (usually), perpendicular to the reference axis red (the arc of the wing). That is, 90 degrees between the red and blue line. This condition is not mandatory. That is, it was possible to make profiles with angles other than 90. However, in the central part of the wing, it is better to make them perpendicular 90 degrees. S1.6 LEparagliding, pre, air2dxf, lepc, and others executables not running in new Windows version. :-( Why? S2.1 In SECTION 2, What effect does the parameter "displacement in cm" in the sixth column of the blog ? See attached figure “delta displacements.jpg”. The wing is designed basically putting profiles into space, and then calculating and obtaining the shape of the panels in top and bottom surfaces. - The theoretical situation would be that is shown in Figure 1. - But the experimental result is always shown in 2. Profiles without lines are misaligned with respect to the loaded. Due to the distribution of forces. - One option is perhaps force the misalignment of not loaded profiles with a shift “delta” ialong the "Z" axis as shown in Figure 3. Calculated shape of the panels would be ideal for this form. - The experimental result should be shown in Figure 4, all aligned profiles. Though this theory I have not been able to experiment with sufficient detail. At first glance, Figure 3, seems to cause an effect completely opposite to the expected (even more distortion than figure 2). In short, this is an experimental parameter, and if in doubt, leave the delta displacement at 0 cm. To limit the movements in not loaded profiles, the solution are the diagonal ribs. 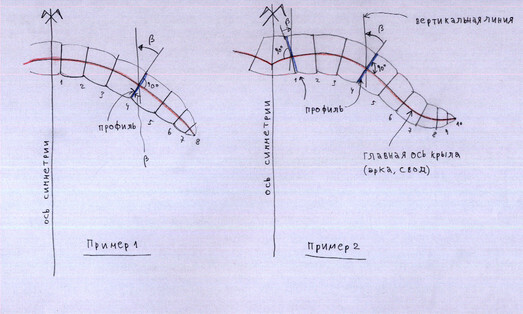 To calculate the alignment of the lines in space, LEparagliding use the theory consisting of align with the center of gravity of the anchor points corresponding of each line (or riser). The simplest solution to get the center of gravity of n points in space is to get each of the coordinates x, y, x as arithmetic mean: sum of each of the values ​​divided by the total number of values. This would be correct if each anchor point support it exactly the same load. But it is not. Therefore, the program uses a weighted average, considering a load distribution in % in A, B, C, D, E. .. and also the length of the airfoil chord. I think I have to explain this in more detail. It is possible to manually assign relative weights of each rib. This parameter allows the designer manually assign relative weights of each rib. It is an advanced parameter, which is not yet fully implemented. Panels inlets (vents), are drawn without seam edges added. In general, if the air intakes are designed open (normal), no need to consider these panel. 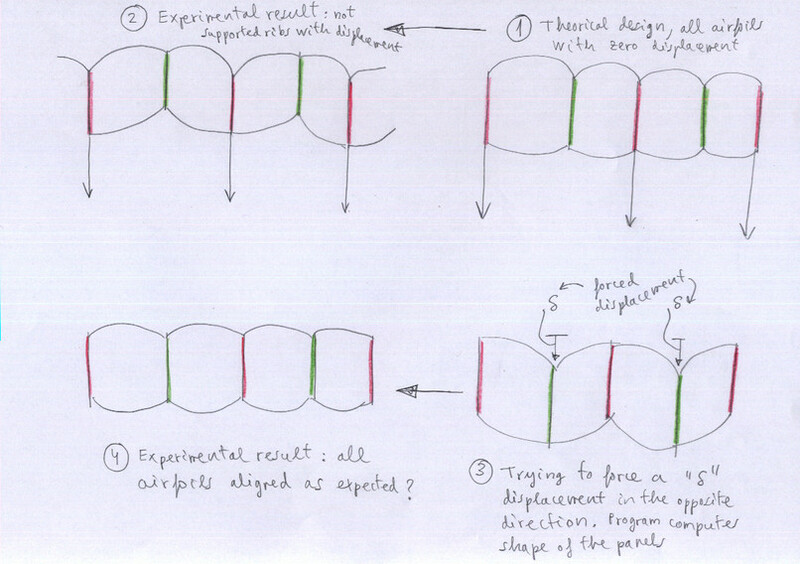 But if some cells are considered closed (for example, near the wing tips), you need to add these panels to the design. In double surface paragliders, these panels can be added at the Intrados panel using the CAD program. 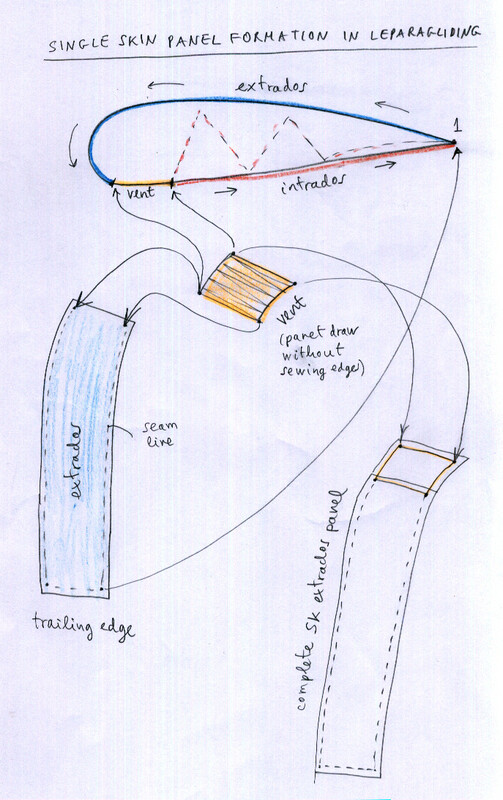 In single skin paragliders, is practical, consider all the air intakes "closed", and add (using CAD) these panels to the top surface, thus forming part of the monolayer single skin. This is how the BHL's models were made. This is part of the "post-process" on the plans in CAD format (DXF). Using CAD, it is possible to cut circular holes, elliptical, or any form of cuts, on inlet panels, to create special shapes. Since version 2.85 this laborious process of "gluing" vents to the intrados or extrados, is automatically performed and controlled individually for each panel in section 26 of the data file.